Gear. We have a lot of it and we have a lot available to us. The arrival of transmog means we now keep much more gear than we ever had. Void storage has allowed us to keep things which were meaningful to us out of our regular bags. The bind to account and heirloom items are a boon to people leveling alts. With their capability of being sent across faction, your tauren in Orgrimmar now benefits from the mace your main in Shadowmoon Valley assembled from archaeology fragments without you having to level archaeology on that toon. Just drop it in the mail and it will be in that toon's mailbox instantly. 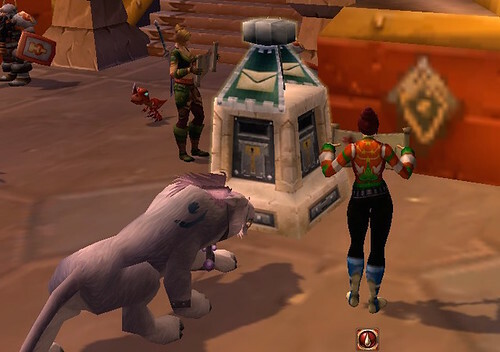 What those of us who have toons on both factions really want, however, is the ability to mail other items across factions. I'm sitting with a couple of shields and a blacksmithing pattern that I want to send to my tauren. In the past, you headed to the neutral auction house, got a friend to watch and you posted your stuff. They bought it and sent it on. There was always a risk, particularly with hard to obtain items, someone would be watching and would buy out your black cat before your toon on the other side bought it. It was rare, but it did happen. With the demise of the neutral AH, this risk has risen because there are players who regularly play the AH, looking for under valued items. It's very frustrating to send materials to the other side now. There has to be a reason this isn't allowed. Blizzard took a great step in combining auction houses so both sides benefit from increased buyers and sellers of goods. But it makes the movement of goods to your opposite faction toons much harder. So, we'd like to see the ability to send any gear or materials to any opposite faction toon attached to our account. You couldn't mail a shield to the opposing faction toon of someone in your guild, just your own. This seems, to us, to be the next step in making our account work better.